Goldberg Lager Beer, from the stables of Nigerian Breweries Plc has become the first lager beer brand to visit the newly crowned Ooni of Ife, His Imperial Majesty, Oba Enitan Adeyeye Ogunwusi. The visit was part of Nigerian Breweries commitment to celebrate the culture and tradition of its valued consumers through engagement, interaction and association. The visit which held before his Royal Majesty’s coronation ceremony in Ile-Ife, Osun State was done as a mark of respect and felicitation with the Arele Odua Ojaja II. The event had in attendance, the Business Manager for Ibadan, Nigerian Breweries Plc, Mr. Joseph Bodunrin, Public Affairs Manager West/Mid-West, Mr. Tayo Adelaja, Brand Manager Goldberg, Mr. Mfon Bassey and other dignitaries. He added that Nigerian Breweries has been known for brewing quality products for nearly 70 years and also known for giving back to communities where it makes its money by helping build human, economic and social developments. The Ooni called for the continued partnership of the company and traditional rulers and their communities around the country. He also urged other corporate organizations to become more involved in corporate social responsibility to endear their products to the people. 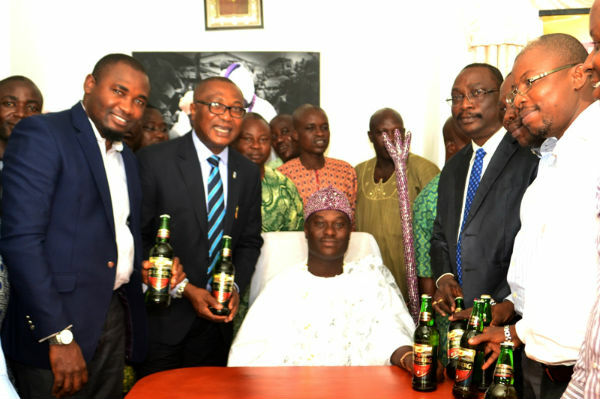 Ogunwusi added, “Your reverence for culture has been able to see you standing despite the economic recession that has been experienced in the country.” He promised to maintain a close association with Nigerian Breweries and the Goldberg brand. The Business Manager Ibadan, Nigerian Breweries Plc, Mr. Joseph Bodunrin, said, Nigerian Breweries is the only company that has experience in beer production with local content thereby providing employment to Nigerians. He revealed that Goldberg brand is a brand that respects people and their cultural rhythm which has over the years created a strong bond with cultural festivals in and around the west. Brand Manager Goldberg, Mr. Mfon Bassey, added that Goldberg is a brand that is brewed for the “Befitting man” and has always been part of cultural celebrations like Osun Osogbo festival, Ojude Oba in Ijebu-Ode and the annual Fuji t’o Bam talents hunt. The brand was also present at the coronation of the Deji of Akure.